The other day I wrote a post about what I’d learned from doing the City & Guilds Certificate and Diploma courses in Stitched Textiles. Today’s supplementary thought about this is how fortunate I’ve been to be able to do these courses. I remember reading a while back on a US blog (can’t remember which one) that there is no equivalent of C&G in the USA; the blogger pointed out that we’re very lucky in the UK to have such courses. Having said that, the UK provision of part-time college courses has diminished in recent years, and you may not be able to find what you want at the local college. Still, if you can cope with distance learning, this is always an option. I was wondering what, if any, equivalents of C&G Stitched Textile courses exist in other countries. If you’re reading this from outside the UK, perhaps you could let me know via an email or comment about any course of study you’ve undertaken in textiles and stitching. How did you learn your skills? Was it via a formal course of study? And if so, what course did you do? In this post I want to talk about some of the things I learned from City & Guilds. I completed the Diploma in Stitched Textiles a bit over a year ago, having previously done the Certificate, both with Stitchbusiness in Durham as a distance learner. Ideally, I’d have liked to do a course that I could attend every week, but there isn’t one anywhere near I live, so distance learning was the only option. However, the way Stitchbusiness organise it, there are distance learner weekends around three times a year, so there is some contact which I valued very much. Fortunately for me, they’re based in the North of England so attending the weekends was quite feasible. The scope of both the Certificate and Diploma courses is vast; there’s a lot to do and it can seem overwhelming at times. I got through it all by focusing upon only a small part of it at a time, and just not worrying about all the things that remained to be done. Of course, I learned lots of new techniques and ways of doing things, but in this post I thought I’d just talk about what I consider to be the acquisition of really significant skills. An important thing for me was learning to think about, plan and research ideas before ever starting on projects. I think I got better at it with each successive project, but I’m not quite there yet. It’s very tempting when you have an idea (well, it is for me) just to hurl yourself at it, without thinking it through. However, C&G encourages you to plan and to record the process of planning, to sample extensively and to undertake all necessary research before executing the project. This is a very useful and important discipline and I think it produces better results. 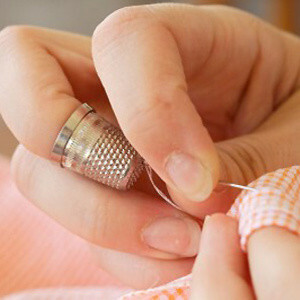 An inescapable aspect of stitching, especially stitching by hand, is that it just takes a long time. I spent many hours on some of my C&G projects and this takes some stamina. To get it finished you just have to stick at it. It’s hard to find sufficient time when you have a job and a busy life, and sometimes the process of completing a project just takes ages. However, if you just keep on doggedly doing as much as you can, even the most complex project gets finished eventually. C&G gives you plenty of practice in persistence. C&G encourages you to do an evaluation of the projects that you undertake, and to write about it. I found this a bit of a chore at first, and was inclined to gloss over it as just another bit of admin. However, once I started taking it seriously I realised that it was actually a useful think to do. Self-evaluation also includes the valuable skills of learning from your mistakes and being really critical about what you’ve done. I find it really useful now to think carefully about what I could have done better and to be stern with myself where I’ve taken shortcuts or haven’t finished a piece as well as I might. Well, those are the three main things that occur to me at the moment. I think the C&G courses have been very valuable for me, and I was sorry in a way to get to the end of them. It’s good to have something structured to work. By the end of the Diploma I felt I’d done enough in this mode of learning, but I certainly enjoyed it while I was doing it.